As part of a Buffalo State museum studies course last fall, art education graduate student Tracy Giblin was charged with creating a collection and keeping a record of it. Some of her classmates collected bottles, clothing sales tags, and other items. Giblin decided to collect children’s hopes and dreams. Her semester-long assignment has evolved into a website and a hands-on project at the Burchfield Penney Art Center. “I wanted to do something that was important to me and the field I am going into,” said Giblin, who wants to teach elementary school art when she finishes her master’s program in December 2013. 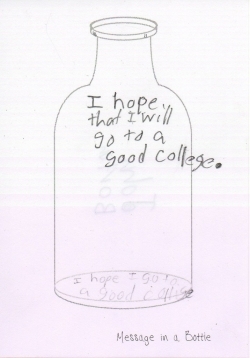 More than 100 third-graders from three area elementary schools were asked to write their hopes for the future on a sheet of paper containing an outline of an empty bottle. 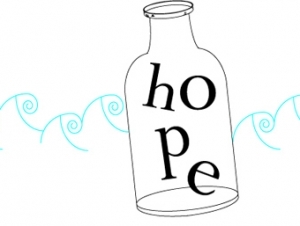 Giblin posted the collection of hopes—from flying cars to a cure for cancer—on the Message in a Bottle Project website. The variety of responses surprised Giblin. Many of the children’s hopes were altruistic in nature. Kathy Shiroki, curator of museum learning and community engagement for the Burchfield Penney and instructor of the museum studies course, said she was so inspired by Giblin’s encouraging enthusiasm to give children a voice about their optimistic views on life that she asked her to present a drop-in project at the art center that the public could participate in. “Tracy’s genuine kindness to see the best in everyone is conveyed in her collection, and continuing the process at the Burchfield Penney is a perfect venue,” Shiroki said. On Friday, May 11, Giblin will host the Message in a Bottle event from 5:30 to 7:30 p.m. in the art center’s studio during the Second Friday celebration of new exhibits. Adult and children participants can write or draw their own hopes and dreams to place in a bottle and share with others. It is free and open to the public. For more information, call (716) 878-3549.